Active middle age women often do not get the vitamins and minerals they need to stay healthy. 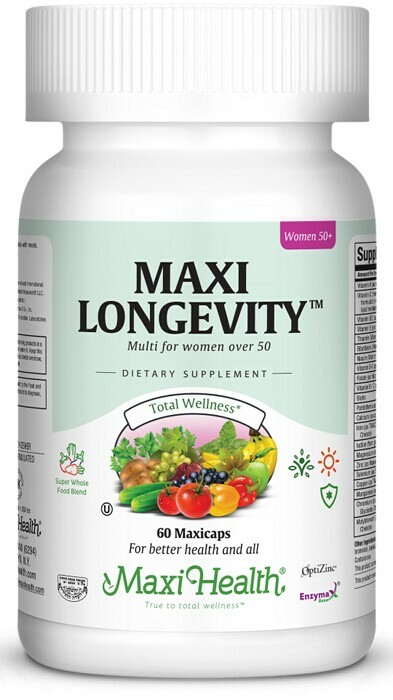 That’s why we are pleased to introduce Maxi Longevity™ for Women. It’s a complete multivitamin/mineral supplement specifically designed to meet the nutritional needs of women over 50. In addition to all the critical vitamins and minerals you expect from us, (see Supplement Facts tab) you can see below what targeted support is all about! Get Maxi Longevity™ for Women for your active life style today and into the future! Other Ingredients: Vegetable cellulose, magnesium stearate, microcrystalline cellulose, Enzymax® (calcium carbonate, bromelain, papain, lipase, amylase, protease, silica), chlorophyll. This product contains NO wheat, yeast, gluten, salt, milk, fish, artificial flavors, or colorings. Biolut™ is a trademark of Biolut SA de CV. Cinnulin PF™ is a trademark of Integrity Nutraceuticals International. Enzymax® is a registered trademark of Maxi Health Research® LLC. OptiZinc® is a registered trademark of InterHealth N.I. Pomegranate 40p™ is a trademark of PL Thomas & Co., Inc.
Inc.U.S. and International patents pending.